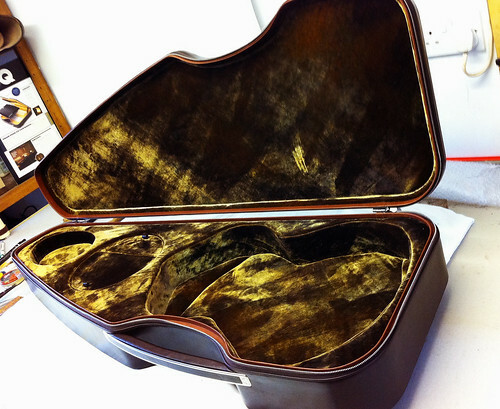 We're just completing a classical guitar case for a US client. The client wanted this completely clean interior without the crumpled velvet effect that we use for our electric guitars. The exterior is covered in Barenia, a classic French leather with a wonderful look and feel. Barenia used in some of the very fine leather goods made by Hermes. The way the light catches the interior shows the irridecence achieved by hand painting the silk velvet.